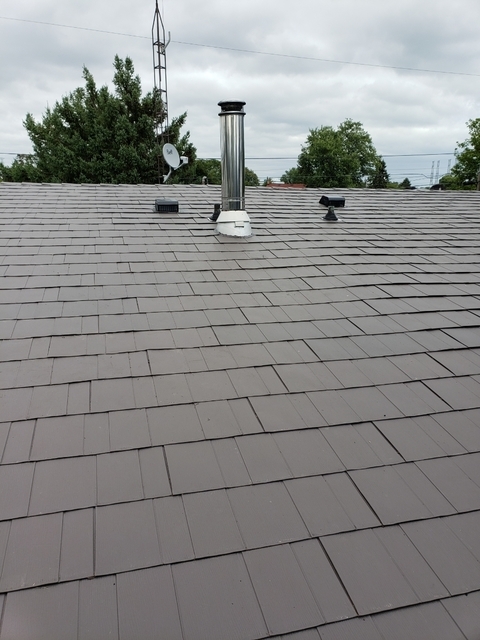 When our house needed reroofing we were faced with a number of options. They ranged from 20 year shingles which actually last about 6 years to copper and tile roofs. We are very happy with our choice of a steel roof from Metal Roofing Solutions. The entire process, starting with the quotation and installation, has been very professionally handled. Adjustments required after installation have been promptly taken care of. 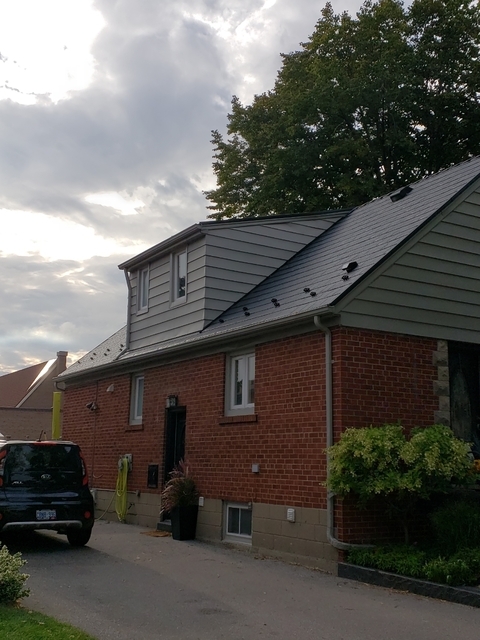 When the roof of our garage needed replacement 2 years after our house roof was replaced we were happy to contact Metal Roofing Solutions and are very happy with the results. We have recommended Metal Roofing Solutions to a number of our friends. Kevin, Annette and family. The pleasure was truly our's at Metal Roofing Solutions. Your project was a great success and your total home renovation has provided you a spectacular home. We are grateful to have had the opportunity to put a MetalWorks roof on it, and the garage. As customers you are just so easy and kind to work with. Thank you for the review. Done quickly and on budget. Friendly crew that did a great job. Could not be happier. Metal Roofing Solutions did a fantastic job on our roof. The company was clear regarding the procedure and the process. We can' t say enough about how simple the whole process was. We love our roof and recommend the Metal Roofing Solution to anyone asking. From the start meeting with Colleen to the installation completion...all awesome! Amazing company, Colleen truly works with your personal needs for a roof and makes sure you’re happy and comfortable with the whole process. My roof looks incredible and it was all done smoothly! Thanks MRS! On our new cottage we wanted a roof that would last of many years. It has been 7 years now and it is the best roof ever. Nothing has damaged the roof like (snow,ice etc. ).I do believe that it will last forever. Colleen was great to work with and her team did a GREAT JOB. Louis and Sharon, I can't believe it has been 7 years since we did your cottage. The project was one that will always stay in my memory as the home is so beautiful and the roof looks fantastic. You were both a pleasure to work with. Thank you for the review. We hired Colleen's company to put on a metal roof. Everything went smoothly and the work was professionally done. They even dealt with a follow up issue without problem. I would highly recommend them. Thank you very much for posting your review. your recommendation is important to us. The roof installed by Metal Roofing Solutions leaks. When the company installer came back to look at the problem area he said he would fix the leaking area. However the company now informs me they have no intention of coming back to actually fix the problem. Another reputable roofing company has told me that since there was ice and water shield installed on the complete roof surface there is no way the roof should leak. He has suggested the problem is poor installation by Metal Roofing Solutions. I am not aware of your roof issue Laurie. We just had Metal Roofing Solutions put Stonecrest Slate Steel Shingles on our home. The crew was hard working, and very meticulous. The foreman was very good at communication. The roof was not even finished and we had neighbours stopping to inquire about the job and who could they contact to have a quote. The roof looks simply amazing. We had quotes from 4 different contractors, and Metal Roofing Solutions was very aggressive with their pricing. While not the lowest priced quote, the look of their product far superior to the competitors. 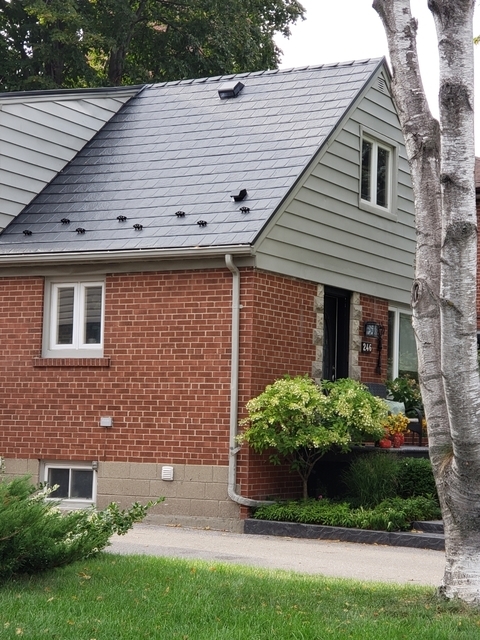 We would highly recommend Metal Roofing Solutions if you are looking for a high end, attractive roof. Need to make an informed decision about getting a metal roof? Metal Roofing Solutions is the right company to contact. the right roofing solution for your home - at the right price.